The history of astronomy goes back, in some sense, since the dawn of time (and in fact, probably even before then). People have always gazed up into the sky and tried their best to make sense of what they were seeing. More recently we’ve build tools to help with this – and in particular telescopes, which hit the scene about 400 years ago when Galileo first peered through his eyepiece. Though even with these tools, it’s always amazed me how much we are able to learn about the universe and our place in it simply by collecting a few stray photons from objects tremendously far away. 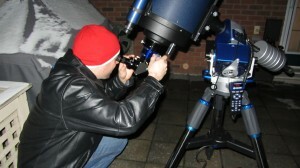 My personal relationship with astronomy began when I was a youngster. I recall searching through bins of Styrofoam balls at a garden centre in order to build a scale model Solar System to hang from the ceiling in my grade one classroom. About the same time my parents got me my first telescope, which I still have. With it I was able to make out craters on the Moon and see the fuzzy rings around Saturn (a sight that is still wonderful every night I see them). Since those early days I’ve upgraded my equipment a couple times, but the curiosity and the wonder of discovering what’s up there has never really changed. I am very much an amateur astronomer today, but I have been fortunate to have had roles (both professionally and voluntarily) where I’ve been able to share my curiosity and passion for astronomy with others. Maybe I’ve even inspired a couple other youngsters to go build Solar System models of their own.